Lisa Shultz’s father died at 89, having outlived his quality of life by five years. A Chance to Say Goodbye is the impressive result of Shultz’s considerable soul-searching about the experience. A WWII veteran who lived alone in a remote area of Colorado, Shultz’s father had lost his hearing, mobility, and autonomy. Multiple heart attacks, a stroke, a fractured hip, dementia and depression forced him off his beloved ranch and into the medical system. That, in turn, forced his daughter, a former physical therapist, into the role of decision-maker, grappling with choices that left her at odds with medical professionals who dealt with death by refusing to address it. Conversations about her father’s wishes were put off until he was incapable of having them. For Shultz, prioritizing or solving his issues became “a never-ending hopeless job.” Sadly, her dad’s death, from pneumonia and other complications following gall bladder surgery, brought her neither peace nor closure. Instead, she ruminated about his final days, “dark with unnecessary confusion and turmoil for him and for those he left behind,” and the lessons they held. Part tribute, part memoir, part guide, A Chance to Say Goodbye succeeds on all counts, with lyrical writing and thorough research. 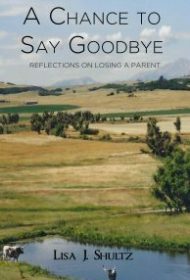 The book is divided into sections devoted to her father’s life, reflections following his death, and resources for dealing with aging parents or preparing for one’s own death– resources she desperately needed but didn’t compile until after the fact. In recounting her father’s story, Shultz enables readers to share in her loss. And she offers a wealth of practical advice on everything from writing an obituary to clearing out a house. Shultz also writes passionately about the high cost—human and financial—of what nurses call “the million-dollar sendoff,” the aggressive, hyper-medicalized care at life’s end that adds neither quality nor time. Thought provoking and absorbing, A Chance to Say Goodbye has much to offer readers willing to confront the challenging subject of end-of-life.